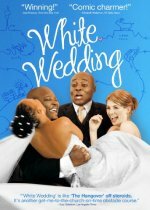 White Wedding release date was Friday, September 3, 2010. This was a Limited in theaters release. Elvis sets off from Johannesburg to travel the 1800 kilometers that lie between him and his bride to be. They are to be married on Saturday. Firrst stop is Durban by Greyhound, but he misses the bus, misses his bachelor party and then things get worse.